You have to have been living under a rock to not know that we were going to the Paso Robles Gourmet Macaroni and Cheese Festival on August 24th. Macaroni and Cheese is one of those comfort foods that instantly takes me back to childhood and hungry for Kraft Mac and cheese with hotdogs, so I was beyond looking forward to this. The Mac and Cheese Fest is a charitable event put together by American General Media to benefit Zoo to You a non-profit organization through the Paso Robles Zoo dedicated to bringing education and adventure to kids, by teaching conservation through interaction. 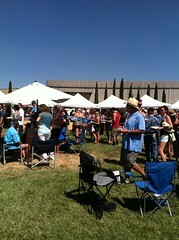 The event took place at Le Vigne Winery pronounced (Le Vin-yaay) and meaning “The Vineyard”, and started at 2pm. The line to get in was really long and everyone seemed very excited. We got our VIP (we were lucky enough to be offered an upgrade) wristbands, glass, plate and plasticware and were on our way through the grape covered bower and out to the large lawn area for the main event. The lawn was lined with booths that were either serving mac and cheese, wine or in the case of BarrelHouse Brewing Co., beer. We started with beer! I got the Kolsch Style Ale which at 2 o’clock in the afternoon in Paso Robles in August, was a no brainer. I’ve been hearing a lot about Kolsch style ales lately as they seem to be making a splash in the beer scene so was really interested in trying it. I found I really liked it, even more than the stout I tried at Forks and Corks and Doug’s Blonde, it was really crisp and refreshing with a light hoppiness but not any bitterness I usually associate with hops. Then it was over to CUVÉE’s booth, where Mari was serving a concoction of macaroni with mascarpone cheese and chocolate ganache, which was very interesting, rich and chocolaty. I’m still not sure what my thoughts are on that one, but Doug really liked it. We saw Liz and David from Red Carpet Winery who said we absolutely HAD to try the Sriracha and Chorizo mac and cheese from Crush Catering. But on our way over we had to make sure we stopped by and tasted Guisseppe’s mac and cheese which was Doug’s favorite; and last year’s first place winner Chef Gregg from Marisol‘s offering, mac and cheese with fresh heirloom tomatoes and basil. Very competition worthy. We finally made it over to Crush and yes their mac and cheese was really something and spicy. As I mentioned it was made with Sriracha sauce and Chorizo, topped with I believe shredded Parmesan cheese. The heat of the day was really starting to affect us so on our way over to the VIP area, we made our way over to where the CorkDorks were taping their show and were fortunate enough to be interviewed by them. Then it was over for more mac and cheese from Spikes and the Pairing Knife and some white wine Doug got me, on our way to the VIP area. The VIP area was set up over by the winery’s famous Pullman train car and overlooking the stage where Jody Mulgrew & The Skeleton Crew were playing. We enjoyed some shade which was a bit hard to come by, picnic tables, and 2 tables – one with charcuterie and another serving a red and a white wine, and a sparkling wine. I took a glass of the Kiara Sauvignon Blanc, since I stuck with the chilled whites all day because it was over 100 degrees. In a big ice-filled barrel there was sparkling EVO revitalizing water in both flavors – cucumber and Pomelo – which in the heat was a great relief! From our vantage point we could see that the crowd was thinning out since the heat was really draining on everyone. As we left the VIP area and tasted some more mac and cheese at Sea Venture (2nd place winner), and Pappy McGregor’s (3rd place winner), both of whom had put lobster in their dish, and some from Jeffrys Catering (The Cork Dorks and People’s Choice award winner), we walked back to the CorkDorks tent and inside were some women from Zoo to You holding a giant Burmese python named Julius Squeezer. I, being a massive Herpiphile, simply had to pet and “snuggle” with him. What an awesome experience. His head alone was almost as big as my fist. 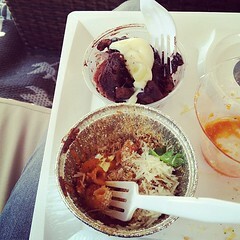 Then I went over to Indulge and tasted their mac and cheese and put my vote in for them. I really liked the spices and flavors, but to be honest it could have been a little cheesier. 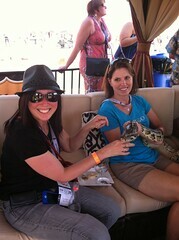 The Zoo To You booth had some amazing critters they were letting people get up close and personal with. 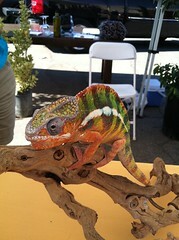 I really was taken by the beautiful and vibrant colors of the Chameleon. We got to meet and pet Gumbo, their approximately 3 foot long alligator, and a baby lemur came out on the shoulder of one of the volunteers. It was very affectionate and gave me lots of kisses on my finger, but one of the things I was really surprised about was the texture of its fur- it felt like cotton balls. It was time to call it a day when the heat started to overwhelm me. I live by the beach where it’s cooler, 25 degrees cooler that day in fact. And that kind of heat just takes it all out of me. So on that note let me say the Paso Robles Gourmet Macaroni and Cheese Festival is a brilliant idea and was put together very well. However with mac and cheese being a hot food, and as heavy as it is (it is after all a “comfort” food) on a hot day, my and several other people’s suggestion would be to either have it much later in the day when it starts to cool off, or (and this would be preferable) later in the year like October/November when it’s cooler. I look forward to next year’s Paso Robles Gourmet Macaroni and Cheese Festival, to tasting all that yumminess, and to pairing it with a wide variety of wines, on a much cooler day.